Wrap styles are hotter than ever this season and for good reason – they flatter every figure and are adjustable to suit your specific shape. I have several pieces in this silhouette and I always feel my best when wearing them. Today I’m excited to be partnering with one of my favorite stores to share with you two spring looks featuring affordable wrap styles that are feminine & chic! 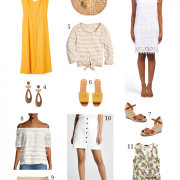 Spring dresses can be some of the most expensive pieces to buy, so I always check T.J.Maxx when I need one for any occasion because they have dozens of on-trend styles for less. Despite what some people might say, you definitely don’t need to spend hundreds of dollars to find a great dress that suits you, especially now that you can shop online at tjmaxx.com! I love that their site allows you to search by silhouette, color, occasion, size & price point here so it’s easy to find exactly what you’re looking for. The texture & feminine print of this wrap dress caught my eye – it would be perfect for a date night, garden wedding or bridal shower. Other styles I love include this off-the-shoulder lace dress, this floral maxi, this yellow wrap dress, this striped maxi & this floral midi. And since straw bags are also on-trend for the season, I couldn’t resist this round handle tote. They have so many great budget-friendly options for summer like this round tote, this fringe crossbody & this structured shoulder bag (love the bamboo handle!) & this embellished beach tote. This not only helps for quick order checkout, but you ‘ll get notified by email when new arrivals hit the site. Because the best items tend to sell out quickly, this is super helpful and only takes a few minutes to look through. I’ve also received early access to new arrivals & exclusive free shipping discounts from time to time, which I always take advantage of! Since their site doesn’t allow you to search by designer name, I’ve found the best way is to search by exactly what style you’re looking for – the more specific, the better! For example, I have discovered some great pieces for summer by searching “embroidered” (like this, this & this), “eyelet” (like this, this & this) and “gingham” (like this, this & this). I hate paying for shipping, so if I’m only looking for a couple of clothing pieces, I will round out my order with beauty items (like nail polish, makeup brushes & dry shampoo) or home decor pieces (like woven throws, outdoor dinner plates & storage baskets) so I can get to the $89 for free shipping – just use code SHIP89! They have this broken down by price for you (under $10, under $20, under $30) but you can narrow the search further by selecting a specific category & choosing your particular size. There are some insanely good deals here – like this stunning lace dress (only $20! ), this chic jumpsuit (just $22!) & this striped top (now $15!). Thank you to T.J.Maxx for kindly sponsoring this post.